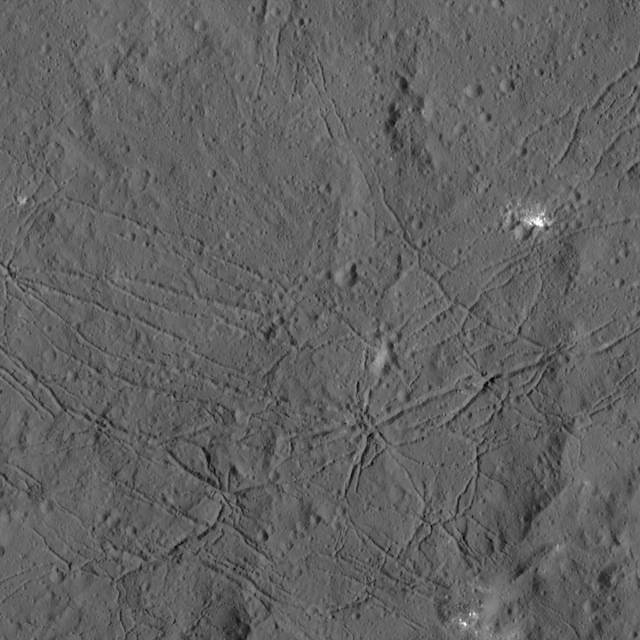 It takes a long time to send high-quality pics down a pipe as skinny as NASA's Dawn space probe has to use: images from its December approach of Ceres are only now emerging. 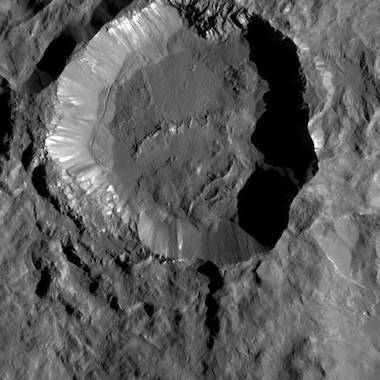 The agency says the images, at 35 metres per pixel, pick out science-worthy detail of the Kupalo Crater, Dantu Crater, and a 32-km crater west of Dantu. The shot of 26-km-wide Kupalo, one of the dwarf planet's youngest craters, shows the bright material on its rim (possibly salts exposed by the impact) and the flat floor NASA says is "likely formed from impact melt and debris." Dantu shows a network of fractures, probably associated with the impact that formed it, while on December 23 the probe snapped the unnamed crater west of Dantu. Those shots show steep scarps, similar to the Rheasilvia crater on Dawn's 2011-2012 target Vesta. Data from other instruments will take longer to analyse: Dawn's mapping spectrometer (covering visible and infrared wavelengths) is working to identify the minerals on Ceres' surface, while GRaND (Gamma Ray and Neutron Detector) is looking for surface elements.